Hi there! My name is Babette. I’m a graphic designer, a brooch collector and a Etsy seller. I love to go to flea markets, drink Earl Grey tea in the morning and organize themed dinner parties. I’ve accompanied my mom to flea markets since I could walk and my love for old treasures grew. From jewelry to bags to dresses: I’ve been collecting them all. 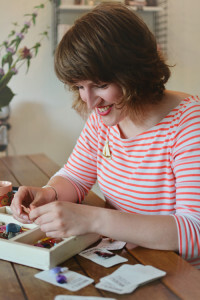 In 2011 I started my first online business called Broesj, where I sold the brooches I didn’t wear anymore. I’m Dutch. In the Netherlands a brooch is pronounced as ‘brosj’. While I was fantasizing about starting my own online shop I came up with the name ‘broesj’. It has something from ‘broche’ and ‘brooch’ in it and sounds a bit like ‘babushka’ (the mistaken name for the Russian dolls, they are called Matryoshka pop. A babushka is a headscarf). Find the vintage brooches at Broesj. Recently I started my second Etsy shop. Here I sell my beloved vintage pull down charts. Variating from a botanical chart to a smaller handwriting chart. For a while I’ve loved them and bought every single one I saw. When my collection grew immensely (no better excuse then to buy them all for My future Etsy shop, right?!) I decided to sell some. Find Mapsj online at Etsy.